Perth Racecourse is to celebrate the Scottish Food and Drink Fortnight in style with a day of racing and hospitality dedicated to the best of Scottish food and drink. Sodexo Prestige, the official catering and hospitality provider at the Racecourse, will serve the finest local produce to 600 hospitality guests on Monday 9 September, as well as hosting the Perthshire Farmers Market and other local exhibitors in the main forecourt. Scotland Food and Drink’s mission is to build Scotland’s international reputation as a land of food and drink. Supported by the Scottish government, they are tasked with growing the value of Scotland’s food and drink sector. The Scottish Food and Drink Fortnight will run from Saturday 7 – Sunday 22 September and will feature a vibrant program of events from farmers markets and cookery demonstrations, to foraging sessions and butchery lessons. The Scotland Food and Drink Race Day will offer samples of local produce from local suppliers to celebrate the start of the fortnight, it will also be a chance to see a great days worth of racing at Perth. Tracey Quin, “We are delighted to be hosting a Scotland Food and Drink themed race day this year, especially as Perthshire has so much to offer in terms of produce and suppliers. “We saw that our event tied in with the start of the fortnight so with our shared commitment to all things locally sourced we thought it would be a great showcase event. “These days people are becoming more and more interested in where their food is sourced from, whether that’s for environmental, health, or economic reasons. 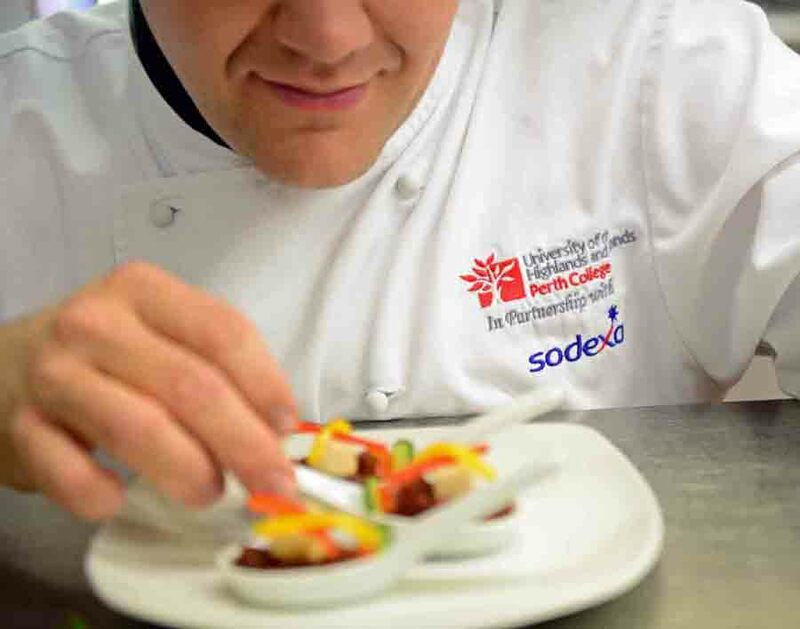 By partnering with Scotland Food and Drink, Sodexo Prestige is confirming its commitment to using the very best of Scottish local produce in all of its menus and all of its events across Scotland. Its team of executive chefs work with local suppliers such as Campbell Brothers based in Bonnyrigg who provide quality cuts of meat from local farmers, Fresh Direct local fruit and vegetable suppliers based in Glasgow and Kilmarnock based Braehead Foods who provide a host of quality indigenous Scottish produce such as cheese and dairy products and wild game. The team has cultivated lasting relationships with each of these suppliers to ensure quality food and drink is served every time. Most recently this expertise and commitment was showcased at the Scotland Food and Drink Excellence awards, where Sodexo Prestige created a menu using produce from the top Scottish food and drink supplier as part of a five course menu, for 400 of the industry’s top names. Stephen Frost, Executive Chef of Sports, Leisure and Events at Sodexo Prestige said: “This is going to be a great showcase of Scottish produce, especially that of Perthshire and the surrounding area. “The hospitality menu has been created to reflect the best of Scotland, from top quality meats and fish, to vegetables, fruit and herbs as well as dairy products from local farmers. “Examples from the menu include smoked venison from the Rannoch Smokery, pork from Kirkliston Farm just a few miles away and late season Perthshire berries to accompany the pavlova dessert. “We are proud to support Scotland’s food and drink and are particularly keen to highlight the world class produce we have on our doorstep. Public relations on Scotland for Sodexo Prestige is handled by the expert PR team at Holyrood PR, providing strategic communication advice and media relations.